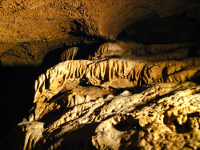 It is the only cave opened for the public in Western Slovakia. The first part of the cave was opened in 1935 in its length of 175 m. The other parts were opened in 1959. Recently, the length of circuit is 450 m, elevation 10 m and there is 151 stairs. Tour takes approximately 35 minutes. Temperature in the cave is 7,1 – 7,8°C. The cave is situated approximately 3,5 km from the castle. It is possible to reach it by hiking trail (approximately 3,5 km) or by car from parking lot Jahodník (20 minutes of walk). On map it is marked as number one in red square. The Fort was built in 8th century b.c. and it covered an area of 12  14 hectares. It had 3 parts  two courtyards and acropola surrounded and divided by walls made of stone and wooden pillars without mortar. Inhabited was only acropola and upper courtyard. In this fort the production of iron and brass was located and it was also a trading place. Archeological foundings suggest that this fort was destroyed during the battle in 6th century b.c. and abandoned afterwards. Nowadays it is important archeological site. Ridge tour with beautiful views, waterfall and ruins of the highest located castle in mountain range Malé Karpaty. Peak Záruby is the highest peak. Havrania skala is hiking place with nice views and also good place for rock climbing. Whole ridge tour lasts about half a day. It is possible to start and end tour in Smolenice village. On map Havrania skala is marked as number one in red square.